No. 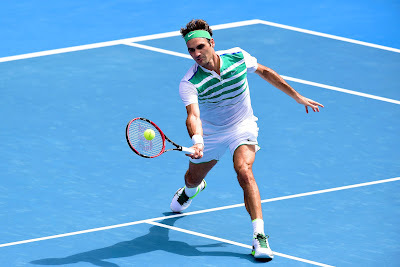 3 seed Roger Federer booked a trip to his 12th Australian Open semi-final on Tuesday in Rod Laver Arena, simultaneously extending his record for the most final-four appearances in Melbourne in the Open Era, via a 7-6 (4), 6-2, 6-4 win over Tomas Berdych on Australia Day. Federer and Berdych traded breaks in the third and fourth games of the opening set. Berdych saved a set point serving at 4-5, 30/40, but the No. 6 seed couldn’t hold off Federer in the tie-break. The 17-time Slam champ carried the momentum into the second set, converting service breaks in the first and seventh games to further distance himself. They again swapped breaks in the second and third games of the final set. But with Berdych serving at 4-all, he was broken for the fifth time, giving his opponent a chance to serve out the match in two hours and six minutes. Federer finished with 48 winners to 26 unforced errors. His aggressive attack resulted in 24 of 29 (83%) successful net points. Tuesday’s quarter-final marked their seventh Grand Slam meeting, and their third at the Australian Open. Federer remains unbeaten against the 6'5'' Czech in Melbourne, including rallying from a two-set deficit in 2009. He now holds a 16-6 advantage overall in ATP Head to Head encounters. Federer had lost their past two meetings at a major - in four sets in the quarter-finals at both Wimbledon in 2010 and the US Open in 2012. Berdych, who was bidding to reach the semis for the third consecutive year, was also aiming for his 550th tour-level win. Just six active players have reached that milestone - Federer, Rafael Nadal, Novak Djokovic, David Ferrer, Andy Murray and Tommy Haas. He has now lost 13 of his past 14 matches against Top-3 competition. Federer, 34, is the oldest man to reach the semi-finals at a Grand Slam since Andre Agassi (35) at the 2005 US Open.